We are engaged in manufacturing and supplying the premium quality of Cordless Phone Trainer. Owing to its compact design, high performance and optimum functionality, the offered cordless phone trainer is highly demanded. For manufacturing the offered cordless phone trainer, the latest quality materials and advanced technology is used. Demonstrates the working principle & working of cordless phone. Unit: Main unit with charger. Key functions : Volume ; digits, *, #, redial. Battery : In – built. Battery Charger : To be provided. Non – destructive fault creating facility using rugged toggle switches for 10 regular and common faults are provided. Brass test points of 20 mm minimum length is provided at various stages in the circuit to observe the waveforms and voltages are possible. Housed in an elegant powder coated MS cabinet with lid with a well spread intelligently designed layout with transparent acrylic sheets on both the top and bottom for dust proof viewing of the circuitry and mechanism. Supported by a comprehensive instruction manual completely with theory and operation details. Possible to study the various sections and understand / observe the function of internal / external controls. Power requirement : 230V, AC, 50 Hz, 1 phase. 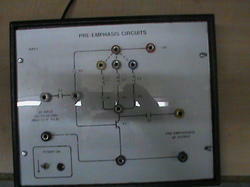 Demonstrates the principle and working of a Pre – emphasis circuit. Supply required 230 V, 50 Hz AC. Built – in IC based power supply with short circuit protection and LED indication for supply “ON”. Transistorized Circuit with Selectable L / R network to get different time constants. Plot the graph of input frequency v / s output voltage for different L / R time constants. Test points provided in the circuit at various stages to observe the waveforms and voltages. * Designed for educational & experimenting purpose. * Demonstrates the principle & working of various microphones. * Strongly supported by a comprehensive instruction manual complete with theory and operation details. * One Loudspeaker to transmit the Audio Signal as Source for the Microphone under test. 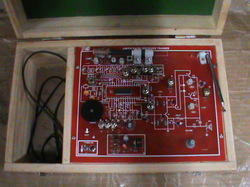 * Amplifier – Low noise, variable gain dedicated amplifier. * Motorised directional plate with auto and manual mode. * Frequency Response with calculation of gain in dB for various microphones various distance & various inputs and plotting of graph. * Directional Response with calculation of gain in dB for various microphones various distance & various inputs and plotting of polar graph. * Demonstrates the principle of Pulse Amplitude Demodulation. * Demonstrates the principle of pulse amplitude modulation. * Demonstrates the principle of a Frequency Shift Keyed Demodulation. * Demonstrates the principle of Frequency Shift Keyed Modulation. * Demonstrates the principle of Amplitude Modulation and Demodulation. * Built – in carrier signal generator with Amplitude adjust, frequency adjust, and waveform adjust potentiometer on the front panel. * Observation of Amplitude Modulated signal at the output on CRO. * Calculation of Modulation index. * Observation of amplitude modulated waveforms for different modulation depths. ü Completely self contained stand - alone unit. ü Designed for educational & experimenting purpose. 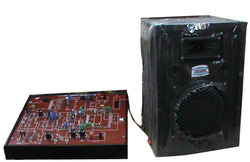 ü Demonstrates the principle & working of various loudspeakers. ü Test points at various stages in the circuit to observe and record the waveforms and voltages. ü Housed in an elegant metal cabinet with a well spread intelligently designed layout on the front panel. ü Exhaustive and skill oriented comprehensive instructing manual complete with theory and operating details. 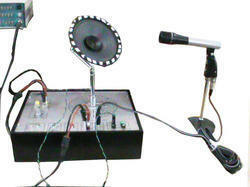 2.One Microphone to receive the Audio Signal as receiver for the loudspeaker under test. 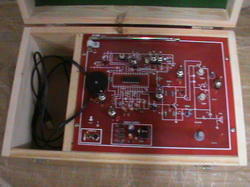 3.Amplifier-Low noise, variable gain dedicated amplifier. 4.Motorised directional plate with Auto and Manual mode. ü .Frequency Response with calculation of gain in dB for various loudspeakers various distance & various inputs and plotting of graph. ü .Directional Response with calculation of gain in dB for various loudspeakers various distance & various inputs and plotting of polar graph. * It is a completely self – contained unit. 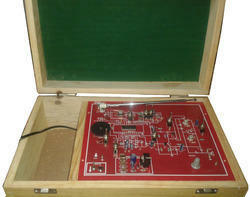 * The complete circuit of a P.A amplifier is printed on a single PCB of size 410 mm x 320 mm. * All parts is soldered on single pin tags on the PCB for easy replacement and fault creation. * Fault creating facilities is provided by removing jumpers and / or by changing parts. * Explanation, observation, alignment and adjustment of internal and external control is possible. * Easy identification of components and measurement of voltage / waveforms is possible at a glance. * Detailed instruction manual is provided. Power Supply : 220V AC 50 Hz. Audio Power Supply : 30 Watts PMPO maximum. Inputs : 3 mic input. Provision : 1 aux input. Output Speaker Connections : 4 Ohms, 8 Ohms, 16 Ohms. Frequency LED : For supply indication. Sensitivity : 5 mV for mic. 100 mV for phono / tape. 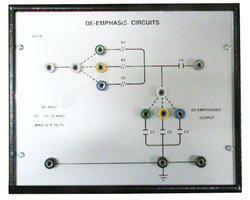 Demonstrates the principle and working of a De – Emphasis Circuit. Bank of Resistor and Capacitor. Plot of input frequency v / s output voltage for different R – C time constant. * Demonstrates the principle of Phase Shift Keyed Modulation. 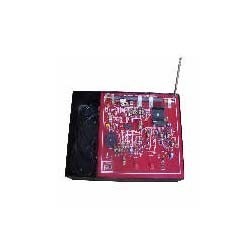 Leveraging by the vast experience of this domain, we have been able to manufacture and supply Super Hetrodyne Transistorized Receiver. The offered super hetrodyne transistorized receiver is valued for its ease of performance. 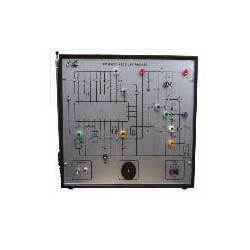 The offered super hetrodyne transistorized receiver is fabricated as per the industry laid norms. 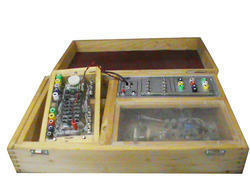 * Provides complete experimental and theoretical knowledge of the latest Radio Cassette Recorder circuit based on IC 810. * Supply required 230V AC 50Hz single phase, monitored by a LED. * Components mounted on single pin tags which are fitted on a specially designed single PCB with full circuit diagram on component side. * Fault creating facility by removing any point. * Designed for educational and experimenting purpose. 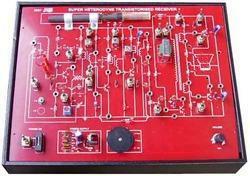 * Provides complete experimental and theoretical knowledge of stereo cassette player circuit based on IC 810. 1. Working Principle : Mixer. 2. FrequencyRange : 520 KHz – 1620 KHz. 3. Output Frequency : 455 KHz. 4. Local Oscillator Frequency : 975 KHz – 2075 KHz. 5. Circuit : Using transistor. 6. Input : 1. By connecting built in ferroceptor antenna. 2. By connecting an RF signal from an RF generator. 7. Operating Voltage : 230V 10 %, 50 Hz AC. From the first day of our establishment, we offer our patrons with the best-in-class AM And FM Radio Trainer. 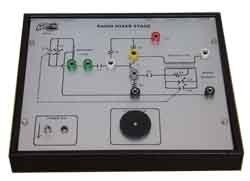 To study the construction and principle of AM and FM radio, the offered trainer is used. Motivated to attain a flawless range, we conduct various quality assurance procedures. 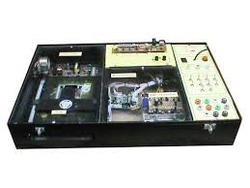 Besides this, the offered radio trainer is rendered by us in various specifications. We are one of the leading manufacturers and suppliers of FM Radio Receiver Trainer, which is used for studying the construction and working of FM radio. Designed by using latest machinery, the offered FM radio receiver trainer is known for its compact design and longer serving life. 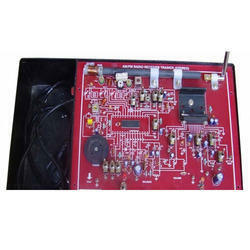 To meet the precise needs of our patrons, the offered FM radio receiver trainer can be customized. Looking for Audio Video Engineering ?